Is every industry easy to automate? 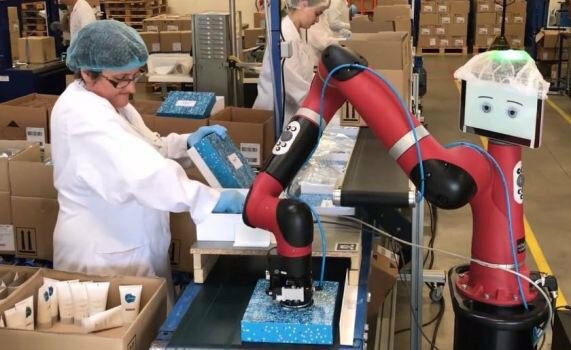 After spotting a picture of Rethink Robotics’ Sawyer robot wearing a hairnet as it got stuck into production at a factory in France, we started thinking about industries that could automate where hygiene is important. Everyone is aware of the strict rules surrounding the processing of food in factories. Even if you don’t work in the food industry, you know the rules about gloves and jewellery and hand sanitiser, all things easily implemented by humans, but is it something we can teach robots? Robots have been used in packaging for years indeed, many food processing plants use them to pack away the finished product. So, how can a robot replicate the hygiene solutions needed to help automate the rest of the workflow? We have the ability to design and develop end effectors for a variety of collaborative robots, the only real limit is the client’s imagination. Our team of designers can easily create these out of food grade materials to enable automation of the food industry. These end of arm tools are simple to swap out and clean to maintain a hygienic environment, are there any other industries where you might be concerned about a robot giving it a go?